Combine all the ingredients for the dressing, taste for salt and refrigerate about 30 minutes. Toss the dressing with the papaya, tomatoes and green beans and return to the refrigerator for 2-3 hours. Garnish with coriander leaves and peanuts just before serving. 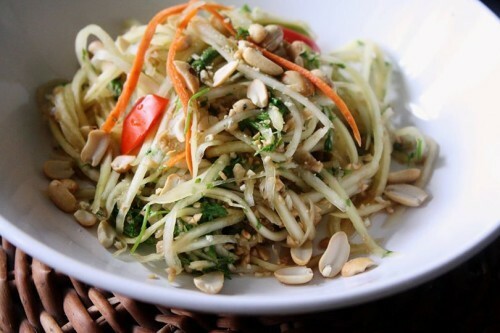 •	For a vegetarian som tum, substitute the dried shrimp and fish sauce with soy sauce. If I have some fermented bamboo shoots I stir in a ¼ teaspoon- its strong smelling and helps replace the fish sauce. You can also use tamarind instead of lime. Regular sugar can be substituted for palm sugar. Som tum dressing can be seasoned to suit your taste. i cannot remember the number of times I've made this recipe. Its a classic and kids love it. Add a little rum and adults love it! You could use a variety of icings, add nuts and flavorings to this cake. 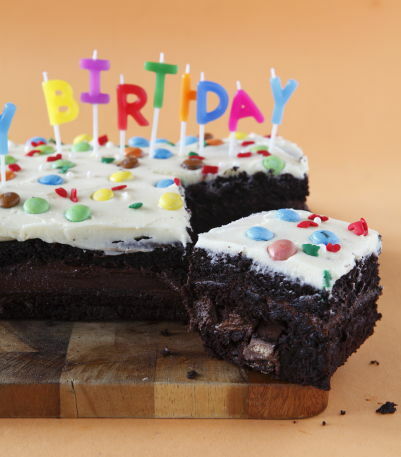 Its a moist cake that stays moist, cuts well and has a light crumb and a deep chocolate flavor. 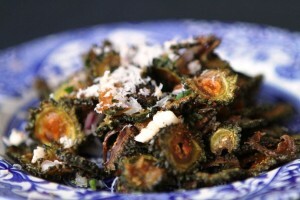 consult your doctor if you have allergies or health restrictions before you enjoy this recipe. Grease the 12 by 8 by 2 or a 9 inch by 2 inch round pan thoroughly and line the bottom with parchment paper. In a large mixing bowl, sift together the flour, baking soda and cocoa in a large mixing bowl. Stir in the sugar. Beat the butter, eggs, oil, vanilla, and water together using a whisk or in a stand mixer or using an electric hand mixer. Add to the dry ingredients and mix until combined. Scrape the bottom and sides of the bowl and beat again scraping the bottom and sides from time to time until the batter is smooth. Gently stir in the chocolate chips. Pour all the batter into the pan and spread it evenly. Bake 35-40 minutes or until a toothpick inserted into the center of the cake comes out clean (except for melted chocolate chips). Cool in the pan for 35 minutes. Gently loosen the cake from the sides with a sharp, thin blade then turn over onto rack and let cool completely. Cover and refrigerate. A cold cake is always easier to slice when you are ready to ice. With a long and sharp blade slice the cake horizontally into two layers on a clean surface. 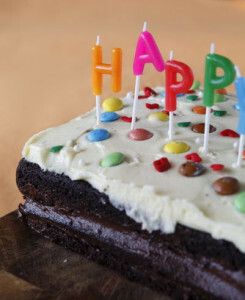 Apply icing as desired and then place one layer over the other. If you don't wish to slice it just frost the top of the cake. For the white buttercream whisk together 1 cup butter, 1/2 cup icing sugar, 1 tsp vanilla and 2 tablespoons milk until fluffy. Cover and refrigerate for an hour before icing the cake. For chocolate buttercream whisk cocoa, 1 cup butter, 1/2 cup icing sugar, 1/2 tsp vanilla and 2 tablespoons milk until fluffy, cover and refrigerate for an hour. Remove both from the refrigerator and whisk lightly. Add some milk if frosting is too thick. You can use the chocolate buttercream on top if you prefer and the white inside. Decorate with edible confetti as desired. 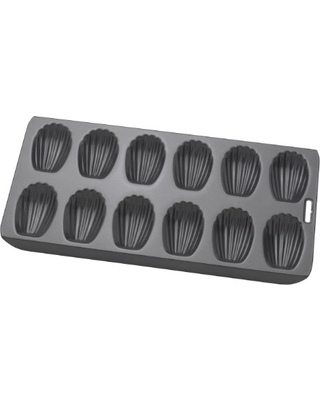 I prefer a metal Madeleine pan- i find the cookies are springier but you could also use a silicone one which is much easier to clean up. 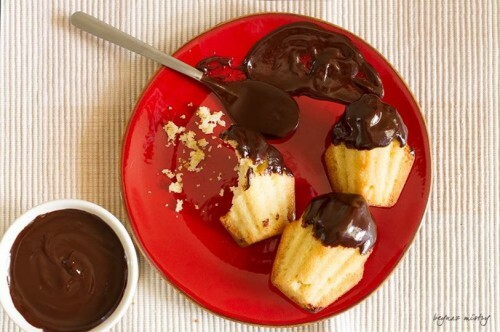 I have several recipes for Madeleines. Some require a fair bit of beating and produce a very light cookie. This one is quite the opposite. Everything needs to be stirred together just enough to incorporate the ingredients. It produces a denser cookie but you can chill the batter in the oven and pop the mold into the oven 20 minutes before you are ready to serve them. Warm, straight out of the oven Madeleines are a treat. I serve them with a big pot of melted chocolate so guests can dip and eat- a bit like a fondue. If you have allergies or health restrictions please consult your doctor before enjoying this recipe. 1. With a pastry brush butter, then flour the Madeleine molds (see photo). this recipe makes 12 individual cakes. 2. Stir together the dry ingredients in a mixing bowl. 3. Stir in the whisked eggs. Do not beat excessively only until lightly incorporated. 4. Stir in the melted butter until lightly mixed. 5. Use a spoon or a pastry bags and pipe the batter into the prepared molds about a tablespoon each. This will expand while baking. 6. Cover loosely with plastic wrap. Chill until firm about 1 hour. Preheat oven to 400 F. You could also bake these just before you are ready to serve dessert. 7. Bake the Madeleine’s at 400 F for 7 minutes, or until they are firm and a toothpick inserted in the center of one comes out with just a few moist crumbs attached. 8. Place a clean kitchen towel on the counter. Unmold the Madeleine’s immediately upon removing from the oven by banging the tray on a hard surface. The cookie cakes should mostly just fall off. If not gently pry them loose with a small knife. They can be dipped after they are cooled. 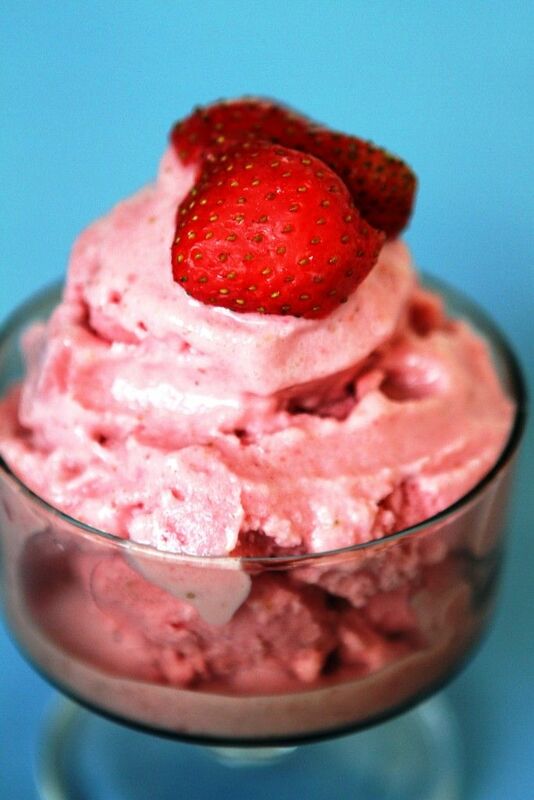 Low Fat Strawberry Banana Ice-cream: If you have health restrictions please checks with your doctor before enjoying this recipe. Recipe for 4-5 scoops. This ice-cream is all natural and contains no eggs or preservatives so it melts easily. • Reserve 2 tablespoons of quartered strawberries in a small bowl. Toss with half a tablespoon of honey, cover and chill. • Put the remaining strawberries and banana in a freeze safe bag or box and freeze overnight. • Tie the yogurt tightly in a cheese cloth. Place over a sieve. Put the sieve over a bowl and refrigerate overnight. • Remove and squeeze excess water out of the yogurt. Use this whey in a curry or lentils. • In a food processor or mixer blitz the frozen banana, frozen strawberries remaining honey and chilled strained yogurt immediately until smooth. • Working quickly put the blended yogurt mix in a freezer safe box and refrigerate until you are ready to serve it. • Scoop into bowls when ready to serve. Top with marinated strawberries and serve before it begins to melt! Delicious Pad Thai noodles. This dish can be made to accompany others at a formal party or serve it as a complete meal for a more casual meal. If you any health restrictions or allergies please check with your doctor before you enjoy this recipe. Bring a large pot of water to boil then remove from heat. Soak the rice noodles for 3-4 minutes until soft enough to eat, but still firm and a little chewy. Don’t over-cook them . Drain and rinse the noodles thoroughly with cold water. Cover and set aside. For the Pad Thai sauce combine hot water, tamarind, soy or fish sauce and sugar in a bowl until smooth. Reserve. Warm a wok or large frying pan over medium high heat. Add 2 tbsp. oil and stir fry onions or shallots, garlic, red chili about one minute. Add the whisked egg and scramble about 10 seconds. Add shrimp then add drained noodles and toss well. 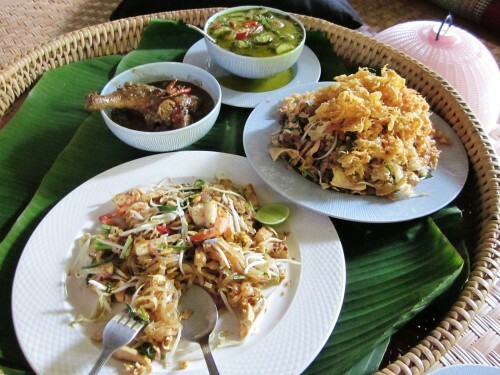 Taste the Pad Thai Sauce for sweetness and tartness- adjust to your taste by adding more tamarind or sugar. Slowly pour over noodles and toss vigorously. Use big tongs to toss the noodles. Add tofu or chicken and continue to toss. Cook until noodles begin to brown and get just a little crispy. Add more sauce, toss and taste. Add the bean sprouts and chives and continue stir frying 1 more minute. Remove from heat and taste, adding more Pad Thai sauce until desired taste is achieved. Serve hot with wedges of lime. 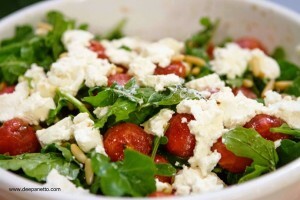 Refreshing Watermelon Salad adapted from a Greek recipe. Perfect for a summer party. If you have health restrictions please consult your doctor before enjoying this recipe. Whisk together the orange juice, lime juice, lime zest, onions, honey, aniseed, salt, and pepper. Add vegetable oil, and stir well. Cover and refrigerate for 1-2 hours. Taste for salt and sweetness before using on salad greens. Take chilled rocket from refrigerator. Tear coarsely. Place the rocket in a large bowl. Drizzle with half the salad dressing, then gently toss leaves. Scatter the watermelon and pour remaining dressing over the watermelon. Toss gently. 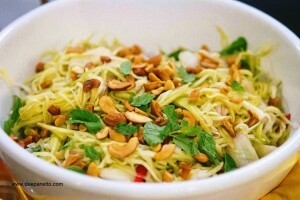 Top with chilled crumbled cheese and nuts. Taste for seasonings and serve immediately. You can also use peanuts instead of cashews. if you want to make this veggie use light soy sauce instead of fish sauce. For the dressing grind chiles, garlic, lime juice, fish sauce, oil, and sugar in a mixer until smooth. Stir in 1.25 tspns salt. Toss mangoes, green onions, sesame seeds, and dressing in a large bowl; season with more salt and sugar if required. Cover bowl and let sit for a few hours in the fridge. This is a fantastic way to eat Karela or bitter gourd. Its a super food no doubt but now its also super tasty. Karela juice is valued by some as excellent blood cleanser. Wash and dry the gourds. Using a sharp knife cut off the tips. Slice and scrape off the spiny surface with a knife. Squeeze the gourds between your palms to release its bitter liquid. Slice the gourds into fine rings about ¼” thick-discard seeds. Sprinkle with 2 tsp salt and leave to drain in a colander for 15 minutes. Squeeze out all the water. Soak them in water for 5 minutes, drain and squeeze again. Spread out on a large plate and dry by patting them with a dish towel. Pour 2” of oil in a kadhai, wok or deep pan on high heat. Fry the gourds, till crisp and golden. Drain in a sieve lined with paper towels, till they cool to room temperature. Toss the fried, cooled gourd slices with the remaining ingredients. Taste and add more salt and jaggery or sugar. Karwar is a coastal town about 2 hours drive from Goa. It has a culinary tradition distinct from that of other cities in the Malwan on India’s western coast, off the Arabian sea . This family recipe comes from my maternal grandmother. 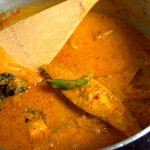 You will notice peculiar techniques like the use of two kinds of souring agents; tamarind and kokum or salted and dried mangosteen fruit, similar ingredients are both roasted and ground and separately sautéed and the use of turmeric for both flavor and color. This curry has a mellow flavor and is easy to make. You can use steaks of white fish like pomfret, cod, halibut or shrimp. For a vegetarian version add potatoes. Wash the fish and drain thoroughly. Sprinkle with 1 tsp of salt, cover and refrigerate. Toast the whole spices and red chillies for the spice paste in a skillet on medium heat for about 2 minutes, till fragrant. Switch off the heat and stir the turmeric powder into the hot spices. Cool and grind to a fine powder. Add the green chillies, ginger onion and rice flour and grind to a fine consistency. Remove the fish from the refrigerator and bring to room temperature. Put the oil in a small kadhai or wok on medium heat. When hot, sauté the onion, ginger and green chillies for 1-2 minutes, till the onion is translucent. 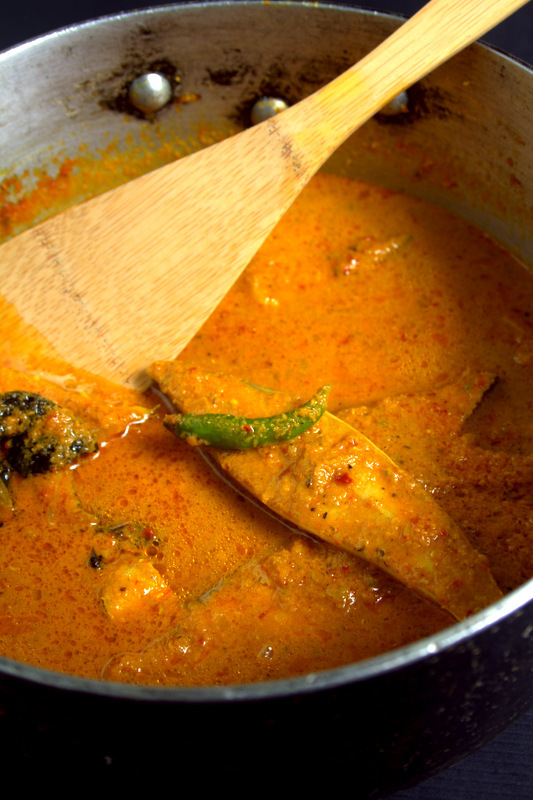 Add the fish, ground spice paste and coconut milk. Squeeze the kokum and strain the liquid into the pan. Simmer for 5-8 minutes or till the fish is tender. Add 1½-2 tsp salt and taste. 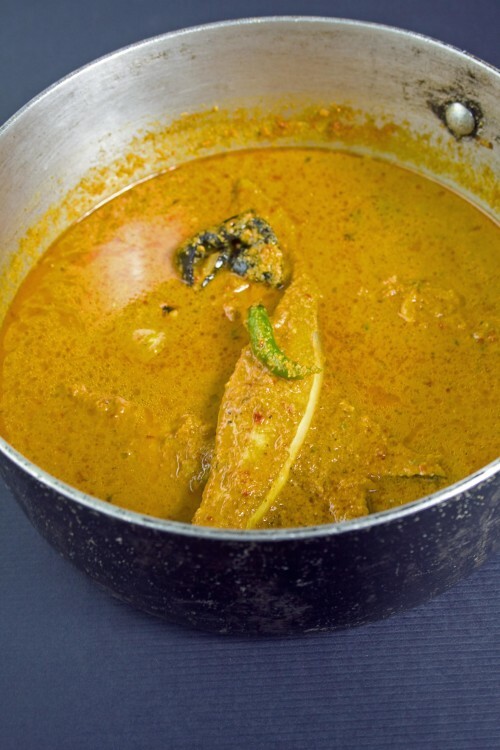 Garnish with lime juice and coriander leaves and serve hot with plain, boiled, white rice. Wash the rice and soak it in water for 2 hours. Rinse the rice and drain completely. Heat the ghee or oil in a large heavy-bottomed pan that has a tight-fitting lid. Add the bay leaf and cloves and sauté on medium heat for about 1 minute. Add the rice and gently sauté for about 30 seconds. Add 5 cups of hot water. Stir, cover the pan and cook on medium heat for about 6 minutes, till the rice is fluffy. Switch off the heat and keep the pan covered so the rice continues to cook in its own steam. Fluff up the rice with a fork and spread on a large plate to cool. Heat the ghee or oil in a large, deep pan. Add the whole spices and sauté on high heat, till they sizzle and rise to the surface. Drain the spices and discard. Add the onions and green chillies to the spiced oil and sauté on medium heat, till soft. Stir in the ginger and garlic and sauté for another minute. Add the tomatoes and sauté on high heat for 3-4 minutes, till they are completely pulped. Mix in the yogurt and Malvani garam masala and continue to cook for about 7-10 minutes, stirring constantly, till the yogurt thickens, splits and releases its oil. If using meat or potatoes add now and stir well. Cook on medium heat, till the meat and or potatoes are tender. Sprinkle in the saffron and salt to taste. Switch off the heat and let it rest for about 10 minutes. Spoon half the cooked rice into the bottom of a bundt pan or a large ring-shaped mould about 4” deep. If you don’t have either of these use a round ovenproof dish that into your pressure cooker. Pat down the rice and dot with some fried potatoes and onions. Spoon all the meat or potatoes with its gravy evenly over the rice bed. Cover with the remaining rice, pat down and seal tightly with aluminium foil. Refrigerate overnight. Remove from the refrigerator and bring to room temperature. Reheat either by steaming in a pressure cooker for 10 minutes, or place it in a bain marie (warm water bath) in an oven heated to 150⁰C for 1 hour. Turn out on to a large serving platter. 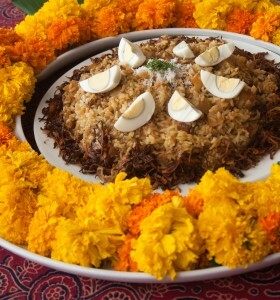 Garnish with the remaining fried potatoes and onions and the hard-boiled eggs and coriander leaves.